Rebellion drove Mercy Rutherford to Scotland to escape the possessive grip of her fiancé. But it’s fate that lands her in the crumbling highlands castle of Lennox Caitheart. A dreamer with visions of inventing airships, he’s most certainly mad. Handsome beyond words, he’s also causing an irresistible flutter in her stomach beyond reason. 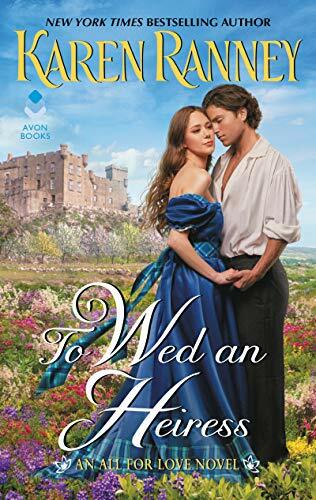 When Gregory arrives to see their arranged marriage to its bitter end, Mercy desperately turns to Lennox with an offer of her fortune—and her hand in marriage. Mercy Rutherford is heading to see her relatives in Scotland. She uses this excuse to escape marrying her fiancé. Along the way, she literally crashes into Lennox Caithart. Lennox was flying his “airship” and immediately felt bad for injuring Mercy and her maid. He invites them into his home to care for them. Lennox and Mercy start to connect slowly but things abruptly changes when he learns of who she truly is. Their families have a bit of a war. Through some prodding from his servants, they push through that bit of tension and start to develop feelings as an easy friendship forms. I liked both Lennox and Mercy. They are very independent people coming together. Lennox is a bit of a dreamer. He wants to fly. Mercy is struggling to get from under her family’s thumb. She wants to pick her own life and mate. Mercy changes the game when her fiancé shows up and she proposes to Lennox. He is skeptical about this as he is a reclusive and wants to do what is right. He is suspicious of everything. It got a bit worrisome after a while because he was falling for her but refused to move forward at certain points. This one didn’t really work out for me. It is an enjoyable read for a lazy day but there is no real drama or angst except Mercy’s fiancé arriving to Scotland to claim her. Yes, he does stir it up but nothing outside of that really occurs. Their families still find it hard to let go of their feud but in the end it kind of all works itself out. Sadly enough, I was a bit more intrigued by Ruthie and Connor. I was curious about this one–thanks for the review.